In this month’s Factors Behind The Forecast I wanted to discuss forecast uncertainty. It’s something you see all the time with especially volatile Maine weather. “Too early to tell”, “This is a very uncertain forecast” and “subject to change” are all phrases you’ll hear often in both my forecast discussions and the forecast discussions of every respected meteorologist around. A common misconception is that forecasters use these phrases because we’re bumbling idiots trying to keep our jobs or trying to cover our tracks if the forecast goes south. However, despite that widespread notion, Mother Nature, especially in Maine, can be legitimately fickle. It is often quite difficult to predict what she will do in the future. I could find dozens of times in the past year where forecasts have been tricky, come down to the wire, involved many moving parts, or have otherwise necessitated strong wording to convey the potential for changes. However, I don’t have to look too far into the rear view mirror to find one of the trickiest forecasts in recent years where, in the matter of a few days, solutions ranging from blizzards to complete misses and everything in between were not only somewhat on the table, but completely possible. Computer models forecasters use as guidance were all over the place. If you follow weather even a little bit, you likely know of the two models, the GFS (American), and the ECMWF (European). There are many other models out there but those are the two get the most media attention. For days leading up to the event, the Euro (statistically speaking superior) forecast a blockbuster blizzard with feet of snow and whipping winds. The GFS (statistically speaking, a close second), meanwhile, saw the storm passing harmlessly offshore. Most other models were in the middle but had solutions closer to the Euro. After looking at the pattern on a very large scale (Western Hemisphere), it seemed as though a large snowstorm was likely. Forecasts were issued as such on the evening of Thursday 17th March, with the obligatory “this is several days out” qualifier to make sure people didn’t panic. Forecasters were still a little skeptical of a blockbuster storm, but overall, sizeable impacts did begin to appear likely. The message my forecast, and the forecasts I saw, were trying to get across was that people should begin to be watching more closely than they already do so they could be prepared should a significant storm pan out. done by the Storm Prediction Centre. This disturbance was supposed to dig south and join up with another disturbance over Colorado. They were to then move east and pick up Subtropical moisture before heading up the East Coast. However, if the Dakota disturbance was weaker, it wasn’t going to be strong enough to pull the moisture north. Models picked up on this and shifted significantly towards the GFS with its “no storm” solution. For my evening forecast on 18th March I focused on two possibilities: a stronger/slower storm, and a weaker/faster storm. I showed model forecasts depicting each solution, explained what each would bring, and then issued my own forecast with expected accumulations and a write-up describing what impacts I thought we would see as well as how the forecast could change. I wanted to put all the options on the table so that people could see what the range of possibilities included. There were still conflicting signals among observations and models that indicated a stronger storm was possible, but the blockbuster blizzard was seeming increasingly far fetched. My forecast for Portland: 2-4”. The trend of less snow continued, for the most part, on Saturday, 3/19. The forecast began to focus on a disturbance moving ashore in Northern British Columbia, Canada. This disturbance was forecast by the models showing a bigger storm to race SE and join up with the upper low from the Dakota disturbance. They were forecast, by the models bullish on snowfall, to combine and form a larger storm that would be stronger, closer to the coast, and would therefore bring more snow. Most guidance (models) on the 19th shifted a little bit west, bringing light to moderate snow. A complete miss was becoming less likely. A farther east solution also mean colder temperatures. After analyzing the snow growth layer and atmospheric temperatures, I also mentioned the potential for the ‘fluff factor’ to lead to higher amounts despite less liquid equivalent (QPF). My forecast for Portland on the evening of the 19th remained 2-4”. On Sunday, the 20th, it would be fair to say that for folks trying to forecast this storm, all hell broke loose. Model guidance is available in two main ‘packages’, one overnight, and one in the afternoon. The models overnight Saturday/Sunday remained bitterly divided. Some indicated a coating-2” while others had 8-12”. Looking at observations, the polar disturbance was matching up more with the bullish models than with the bearish models. The (weaker than expected) upper low was now moving east through the Ohio river valley and the subtropical moisture was ready and waiting offshore. Everything seemed set up for a light to moderate storm but questions remained. The afternoon batch of guidance would be very important in determining which idea (more snow or less snow) prevailed. The early afternoon data was starting to come in line but the two heavyweights, the GFS and the Euro were yet to become available. All was good and well until the GFS broke. Yes, it broke. There was an error in the pre-processing where the observations from all around the world get fed into the algorithms. The long and the short of it is that there was no data from the second best model the day before the hardest to forecast storm of the season. I then turned to the guidance I had and observations. I relentlessly scrutinized every water vapor satellite frame, every upper air analysis, every bit of model data. As I looked carefully at the surface map, a weak low had developed much farther offshore than the main low was supposed to develop. It was dragging the frontal boundary that had all the moisture farther east. Even as the main low developed in the forecast place, it was preparing to follow the boundary out to sea. In the upper levels, the polar disturbance was a full 30-60 miles slower than even the out to sea models predicted. It appeared as though it would not arrive in time to strengthen the storm in time for us to see significant snow. Everything I looked at suggested the storm would go out to sea and minimal impacts would be felt across Maine. At the same time, the critical ridge over the west coast was growing stronger than forecast. Every action has an equal opposite reaction, and that led me to believe that the trough (storm) in the east would be deeper and stronger. I was getting mixed signals not only from models which are notoriously wishy-washy, but from observations, usually rock solid. My forecast for Portland remained 2-4” but I cut back snowfall amounts for most of the rest of the area. That was my final forecast before the storm rolled in that evening. So what actually happened? 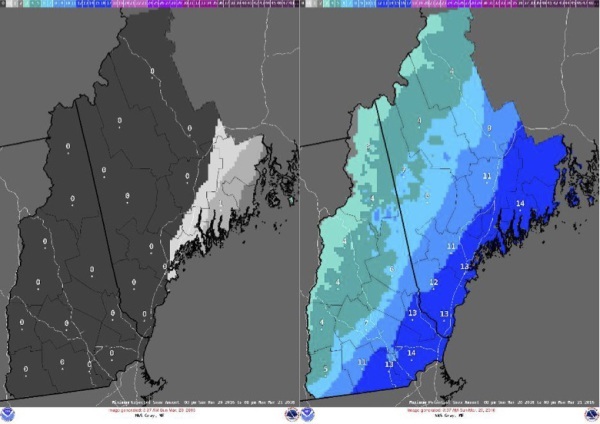 The event took place on the morning of 21 March and featured moderate snow accumulations with many coastal areas seeing between 4 and 8” of snow. Portland saw 6.3” of snow at the Jetport. Most forecasts leading up to the event called for between 1 and 4”, including my forecast for 2-4”. Most forecasts were also fairly wishy-washy with numbers bouncing up and down by the day. This led to confusion and questions from folks like you wondering just how much it would snow. The NWS in Gray put out a best case scenario and a worse case scenario forecast Sunday morning (that’s it on the opposite page), about 16 hours before the snow was set to fly, to give people an idea of the range of possible outcomes. The best case scenario for Portland was not even a flake, the worst case scenario, a foot. I point that out in no way to criticize the NWS and their forecast. I point that out to help show you that even the best of the best were uncertain about how the storm would play out. That is why I have written this article. I want to help show you how complex this forecast was. It involved all the disturbances, fronts, and ridges that I mentioned here plus many more. The position of storms near Alaska and Newfoundland mattered, too, for example. Trying to predict exactly how any one of these moving parts would act would be extremely hard, let alone trying to predict all of them and how they would all interact. Guidance was all over the place, and even when you threw all the wishy-washy guidance out, you were left with equally mixed signals from observations. Even as the storm evolved and impacted us, observations were conflicting. The upper level features I talked about (Dakota disturbance, Colorado disturbance, moisture feed, Polar disturbance) all were slower and weaker than expected. The upper level pattern even as the snow was falling screamed bust. The surface low followed the boundary out to sea and even as the snow was falling, screamed bust. The snow was caused by a sneaky mid level storm that was a good hundred miles (maybe more) farther west than anticipated. Dynamics between 5 and 10 thousand feet caused heavy snow bands to develop and move through the region on the morning of Monday the 21st of March. 6.3” of snow fell at the jetport, and nearly every forecast I saw was too low. Many people were, understandably, frustrated. Is it not the job of the NWS, local media meteorologists or folks like me to provide a reliable forecast for you to plan your day? Expectations are high that forecasters know what they’re doing even as the ‘you get paid to be wrong half the time’ myth runs rampant. When you think about it, if we really were wrong half the time, you would bring your sunglasses, winter coat, t-shirt and raincoat to work or school everyday, just in case. However, that is not how most of us live. Most of us trust some source of weather information — be it the NWS, local TV meteorologists, national TV meteorologists, or folks like me to determine for you what type of weather to expect. You expect us to do a good job and we try our very best. Sometimes we fall short. This was one of those times. I learned a lot from this storm and am now better prepared to forecast a similar one in the future. I hope that after reading this, you understand how complex the forecast was, and why we all pretty much got it wrong. Weather forecasting is incredibly complicated. Predicting the future is really hard and despite meteorology being an advanced science, it is but a work in progress. Remember that the next time you feel the urge to slap your favourite weatherperson! 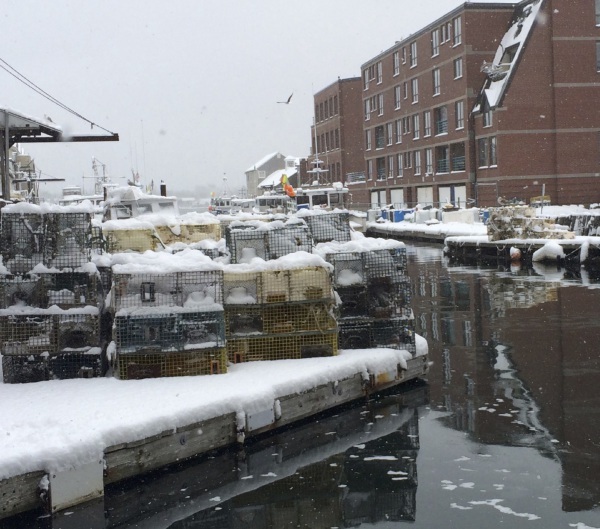 Final result: A six-inch snow blanketing the Portland waterfront along Commercial Street on the morning of 21st March.